We have the knowledge and the experience to integrate complex projects on this new generation of devices. UICC stands for Universal Integrated Circuit Card. It is a new generation SIM (Subscriber Identification Module) included in cell phones or laptops used in some high speed wireless 3G networks. The UICC identifies you to your wireless operator so they know your plan and services. It can store your contacts and enables a secure and reliable voice and multi-media data connection, global roaming and remotely adds new applications and services. 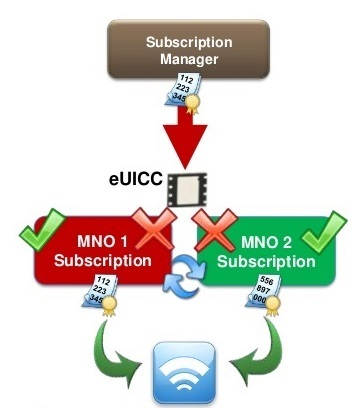 The UICC is the best and only universal application delivery platform that works with any 3G or 4G device. For example, subscribers are able to easily transfer their phonebook and preferences from one handset to another. Technically, the UICC works in all mobile telecom networks. It is a type of smart card technology. Smaller in size than a full card, it contains a computer, or microprocessor, its own data storage and software. It is an evolution of the SIM used to identify subscribers in GSM networks. GSM, or Global System for Mobile Communications, is the most popular standard for wireless technology in the world with 3 billion users (41 percent of the population). Like the SIM, the UICC has an application that stores your contacts and another that can help you optimize your call costs when roaming globally by maintaining a list of preferred networks in the UICC. A big advantage of the UICC over the SIM, however, is it can have multiple applications on it. One of these, the USIM application, is what identifies you and your phone plan to your wireless service provider using one of these standards: Universal Mobile Telecommunications System (UMTS), High Speed Packet Access (HSPA) or Long Term Evolution (LTE). Another application, the CDMA SIM (CSIM), enables access to CDMA networks, which are different from GSM or UMTS networks. Other possible applications include ISIM, to secure mobile access to multimedia services, and non-telecom applications such as payment. For example, many subscribers have a UICC with USIM and ISIM applications for phone service and multimedia respectively. Another advancement is that the UICC can communicate using Internet Protocol (IP), the same standard used in the Internet and the new generation of wireless networks. It also can support multiple PIN codes, which can better protect your digital life by preventing anyone from misusing personal information.